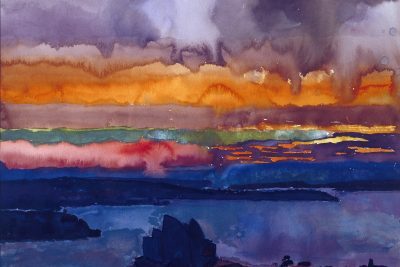 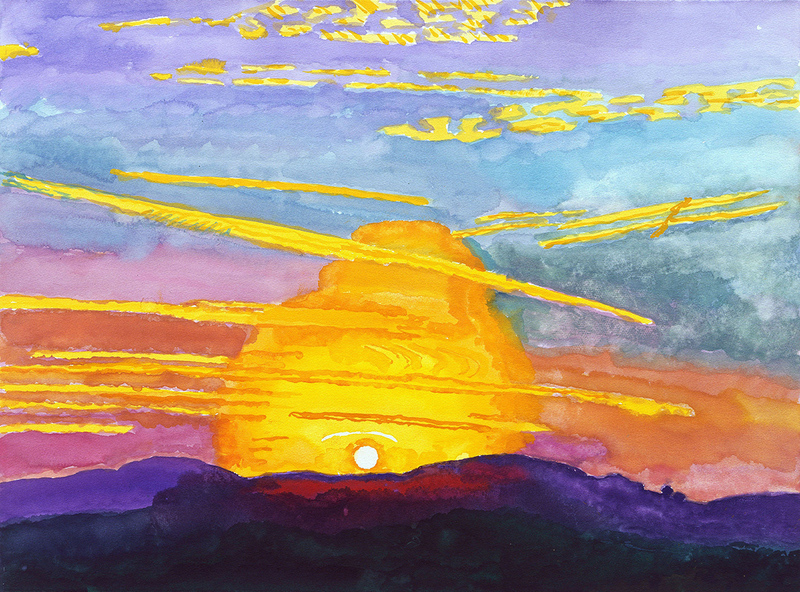 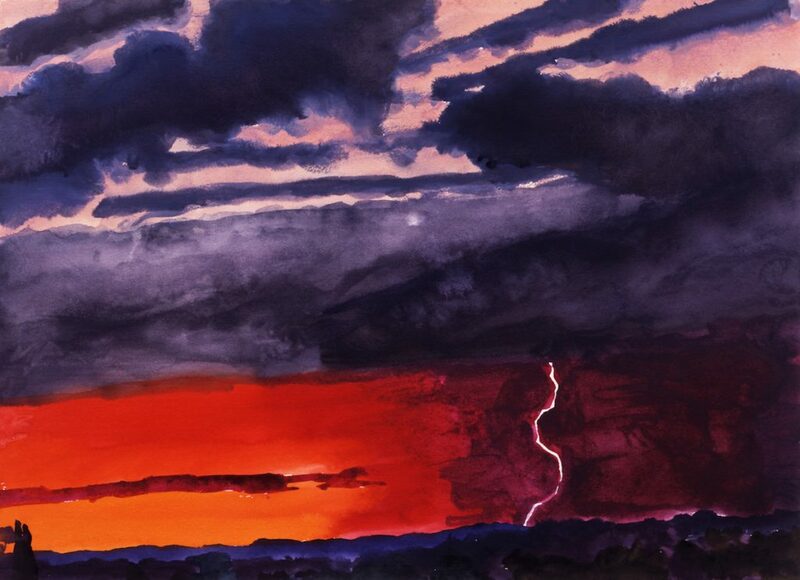 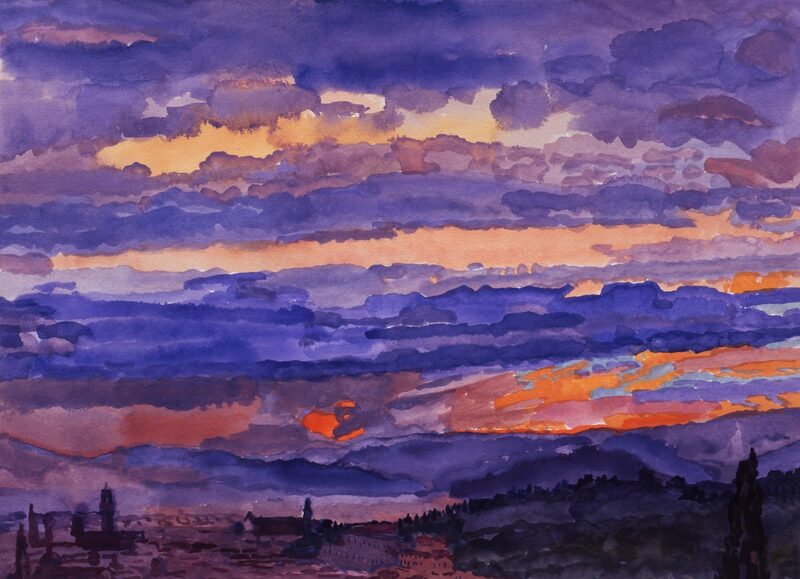 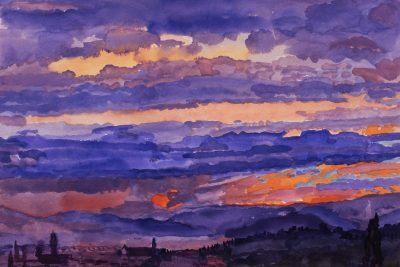 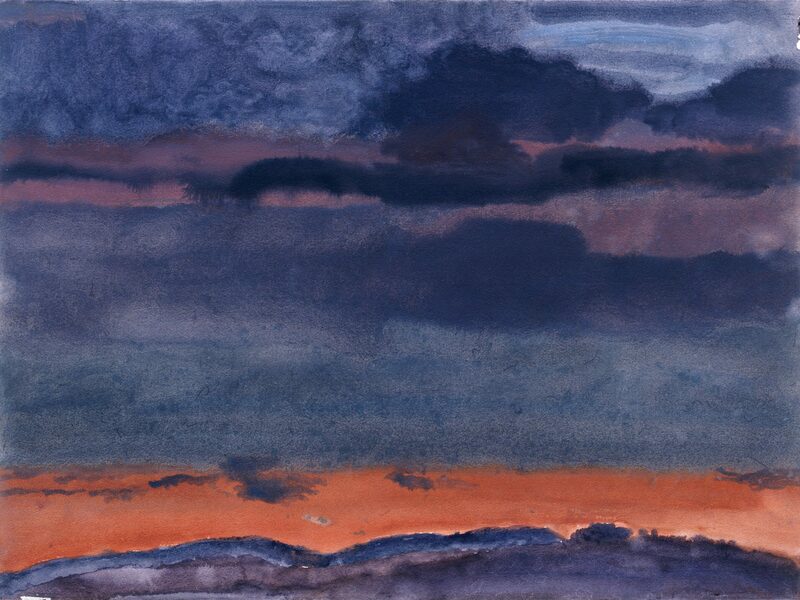 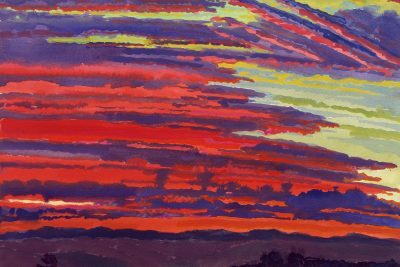 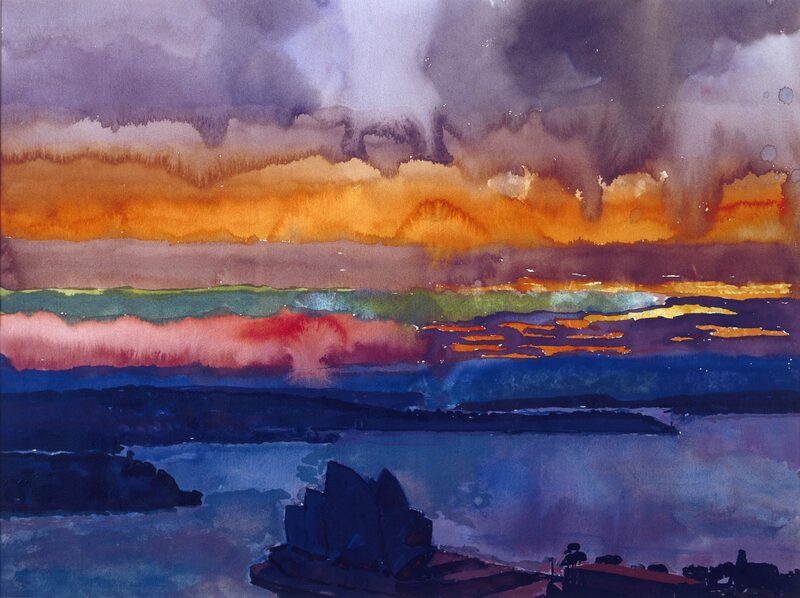 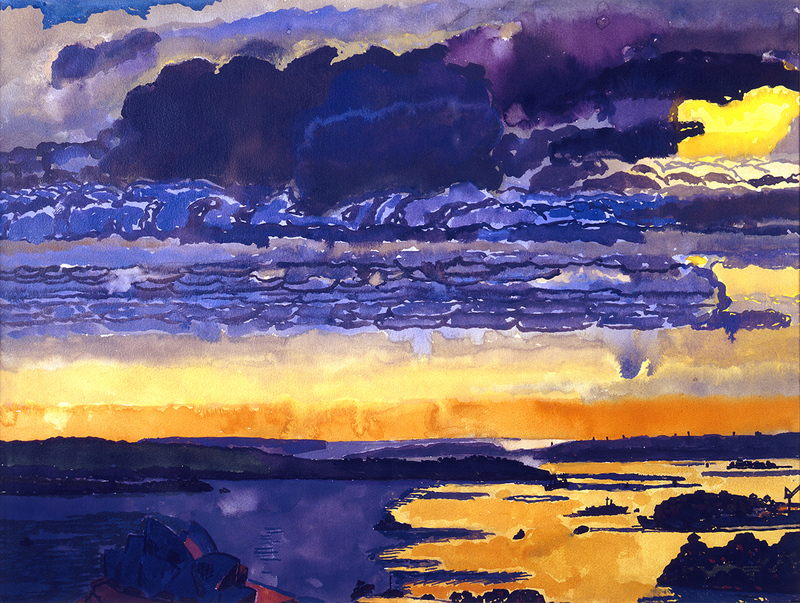 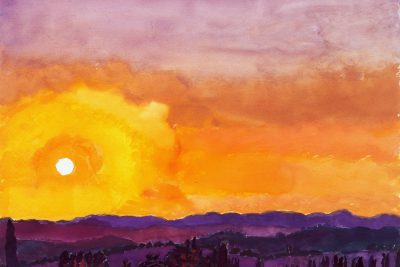 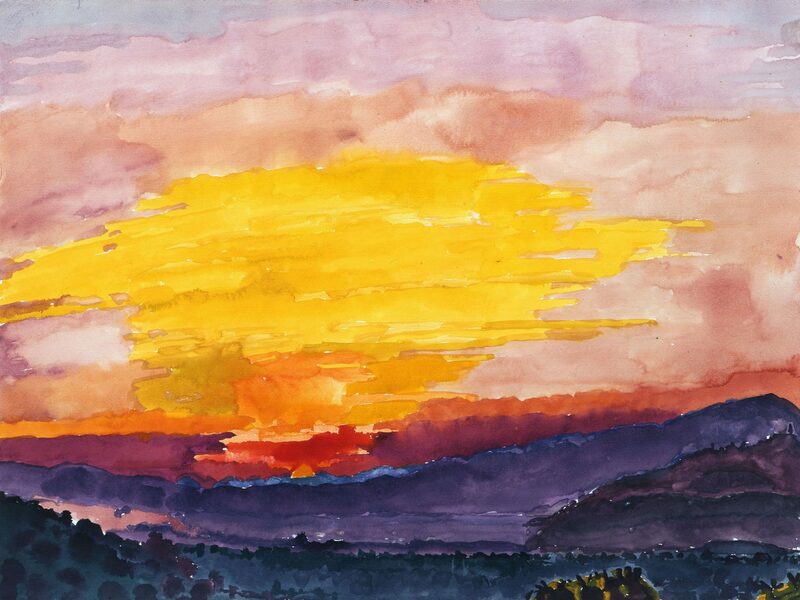 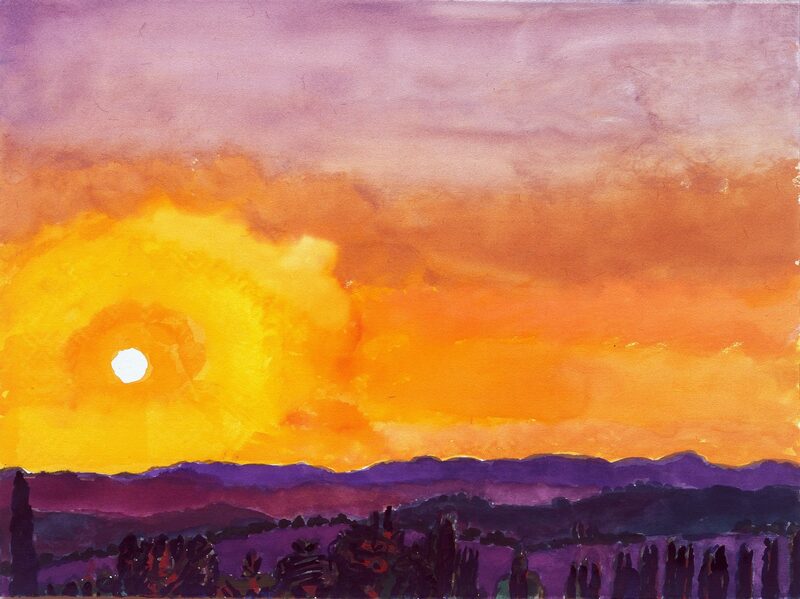 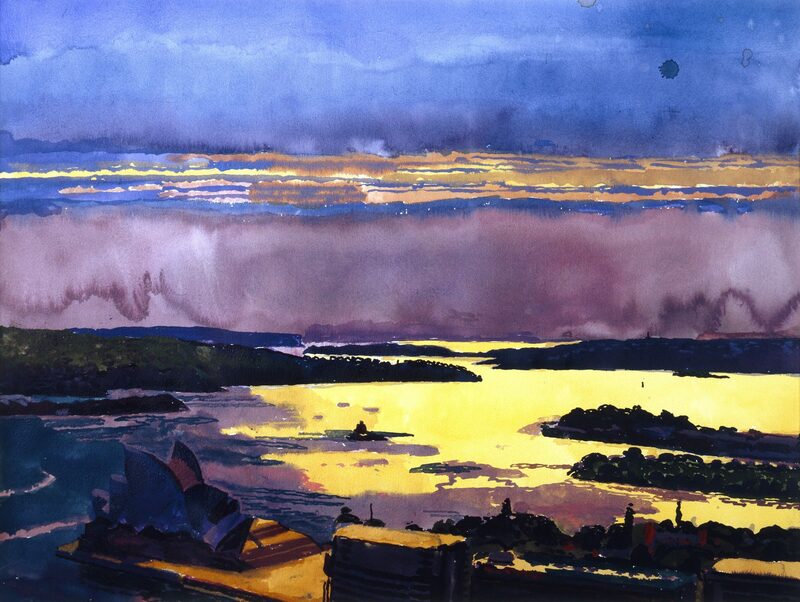 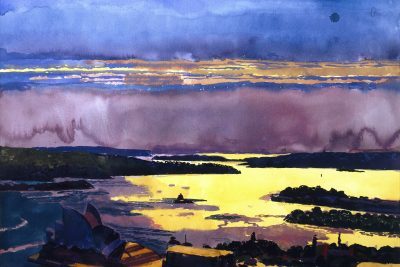 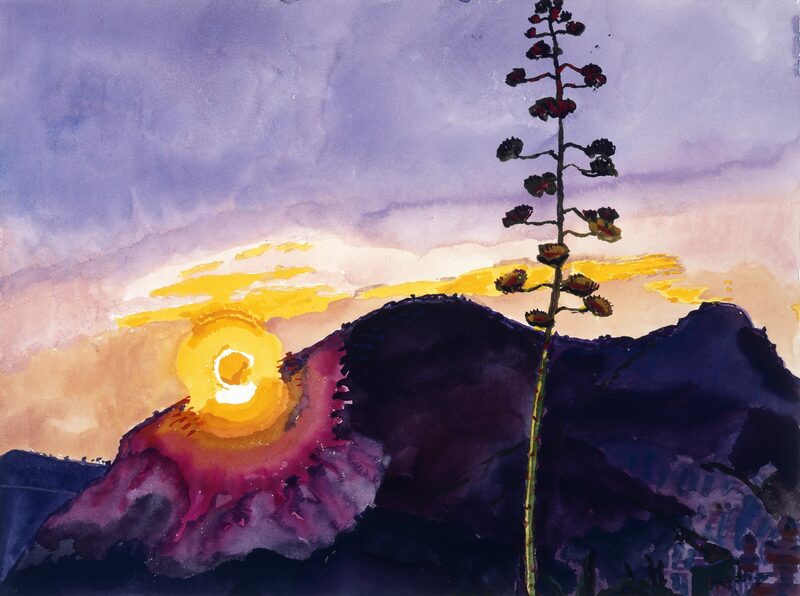 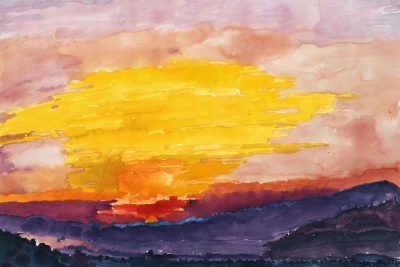 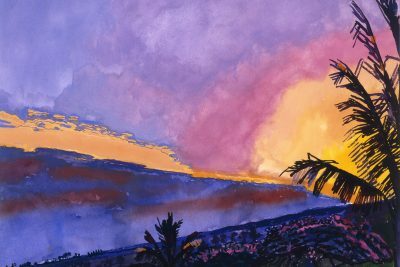 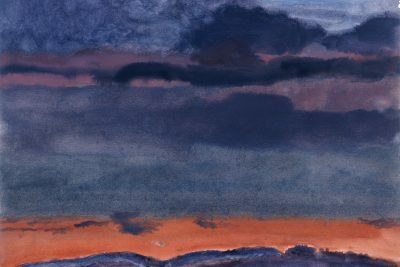 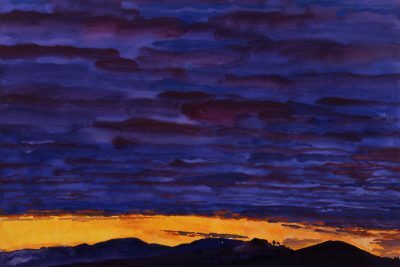 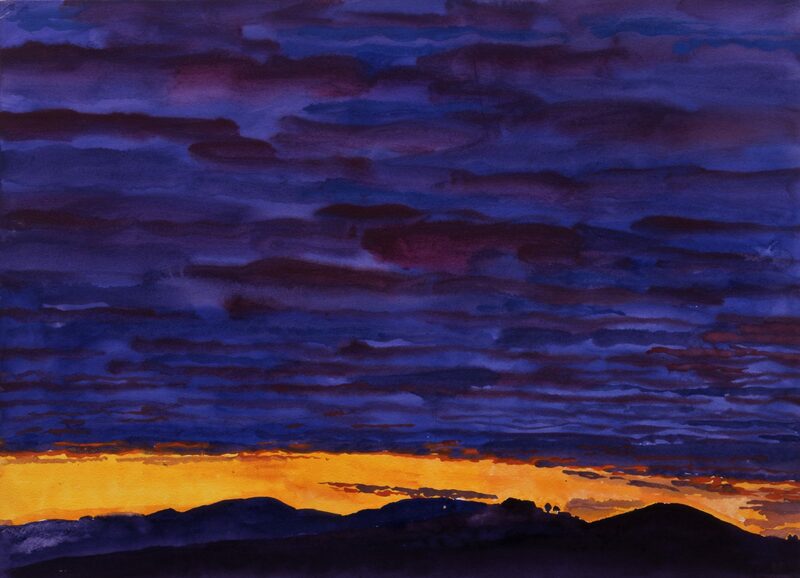 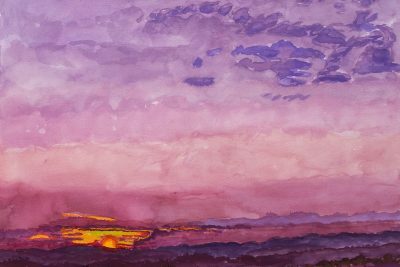 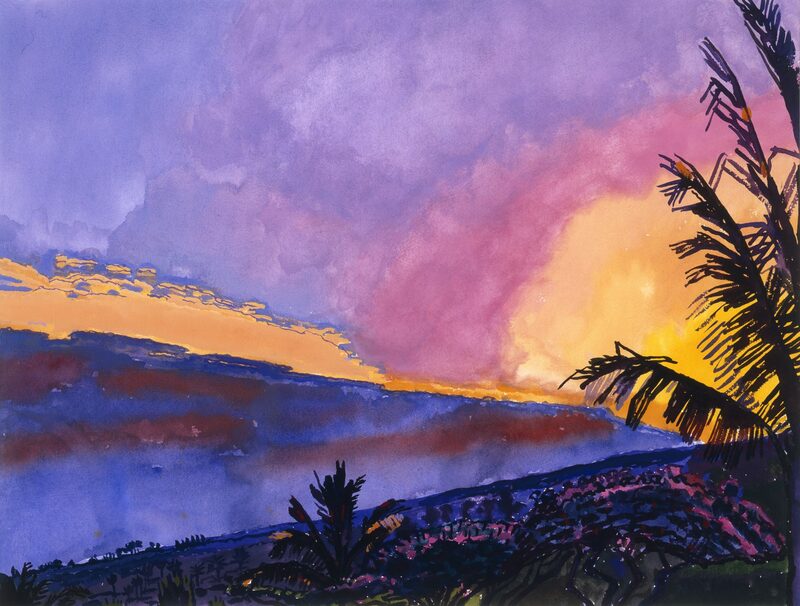 Red Lightning Sunset I, 2005, Watercolor on Paper, 22” x 30”, Courtesy of The William Louis-Dreyfus Foundation Inc. 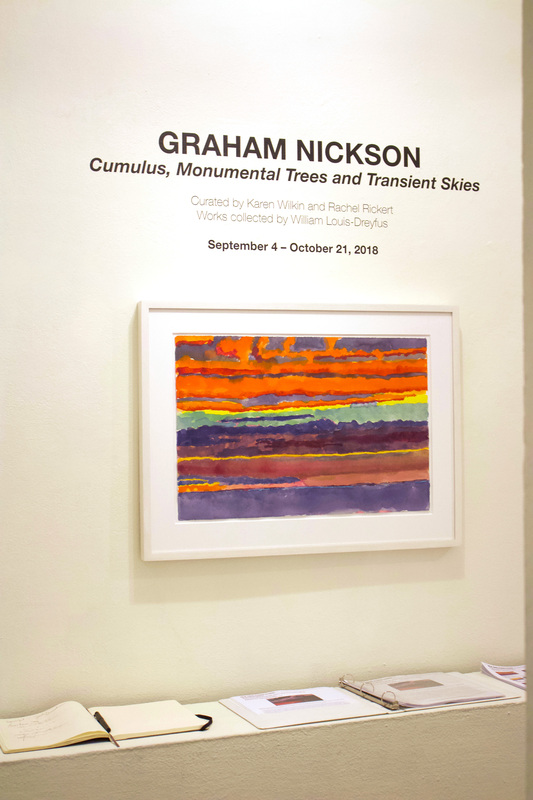 The New York Studio School presents Graham Nickson: Cumulus, Monumental Trees and Transient Skies, Curated by Karen Wilkin and Rachel Rickert, September 4 – October 21, 2018. 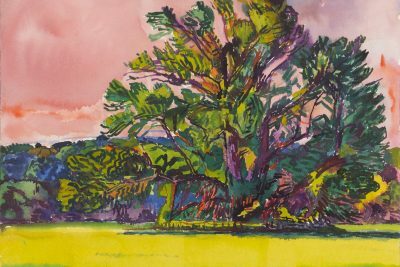 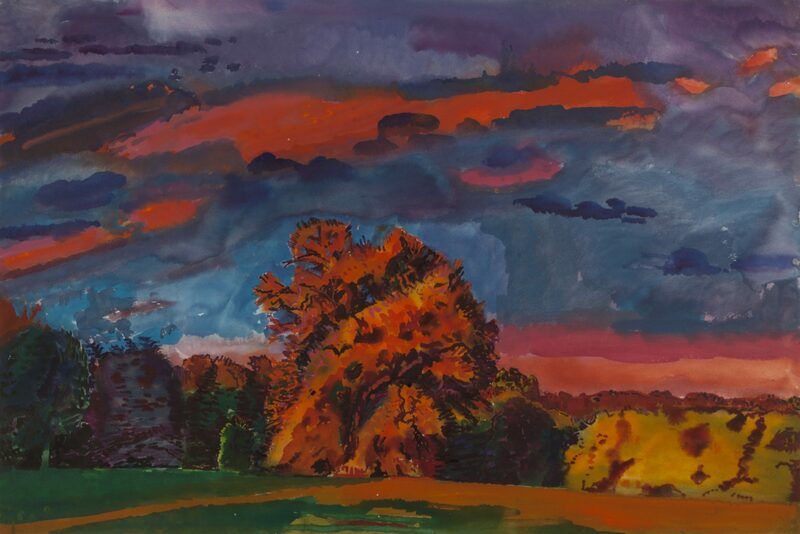 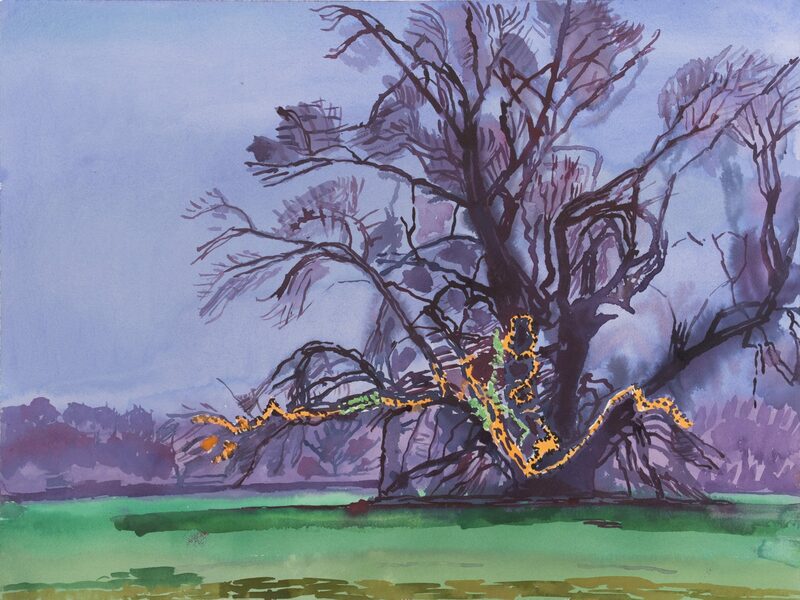 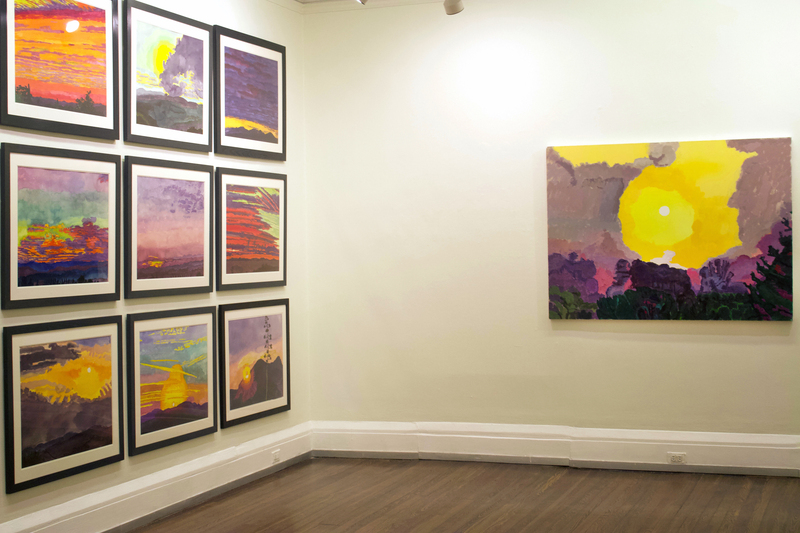 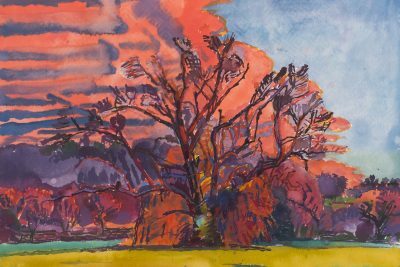 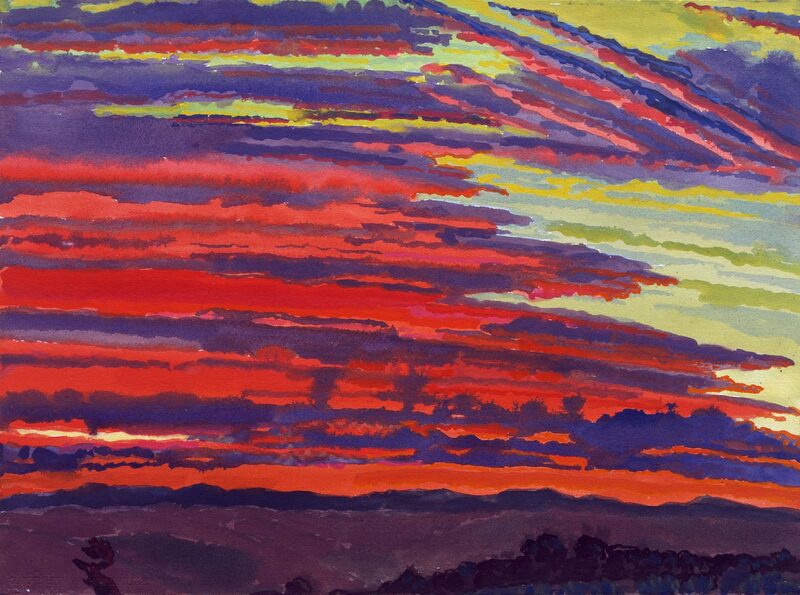 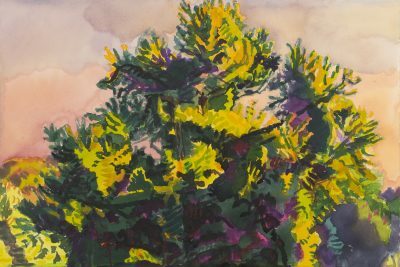 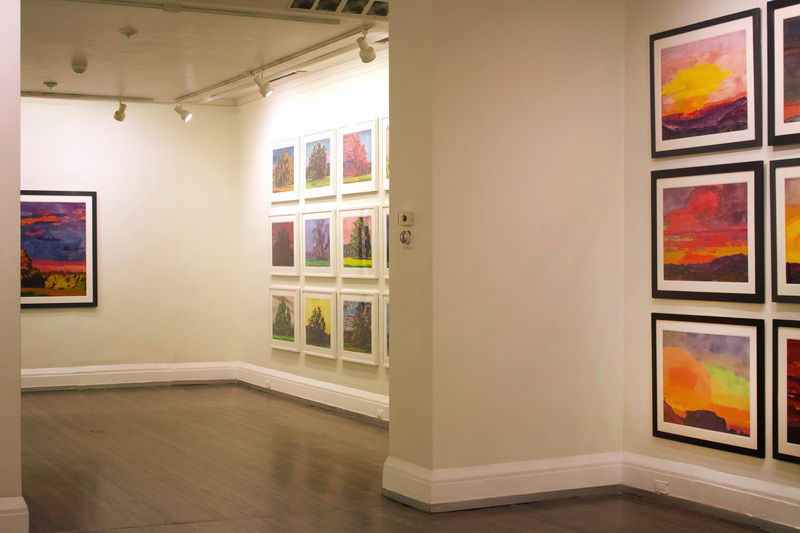 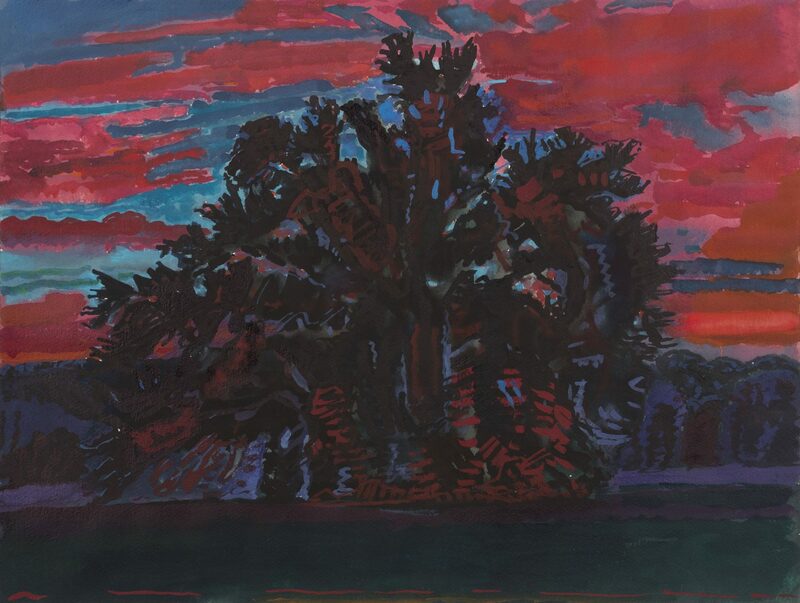 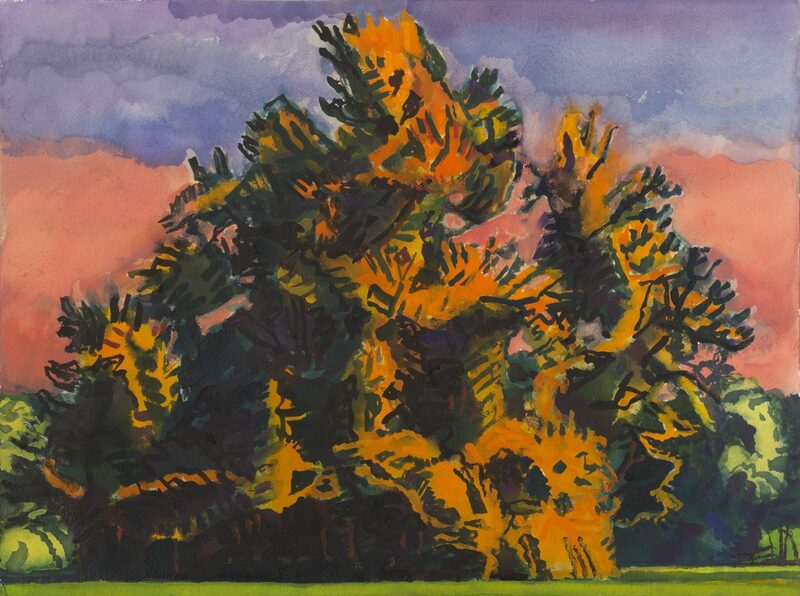 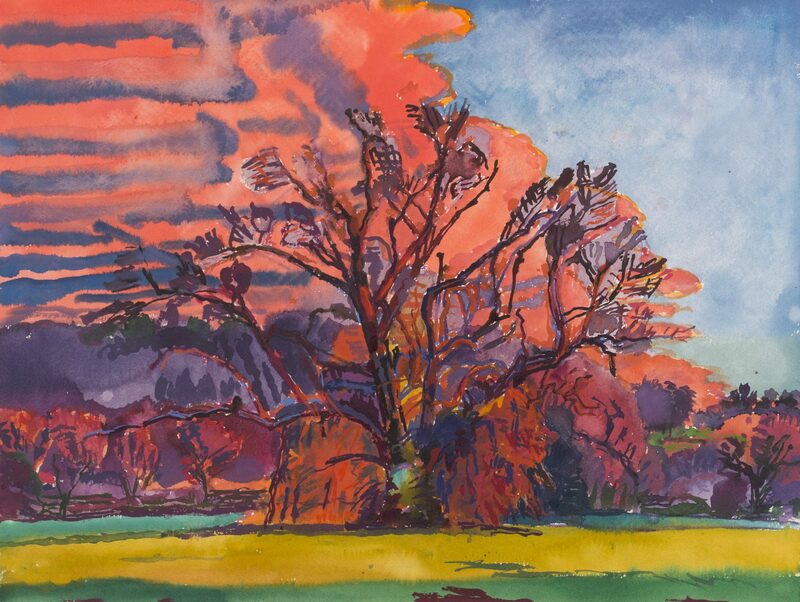 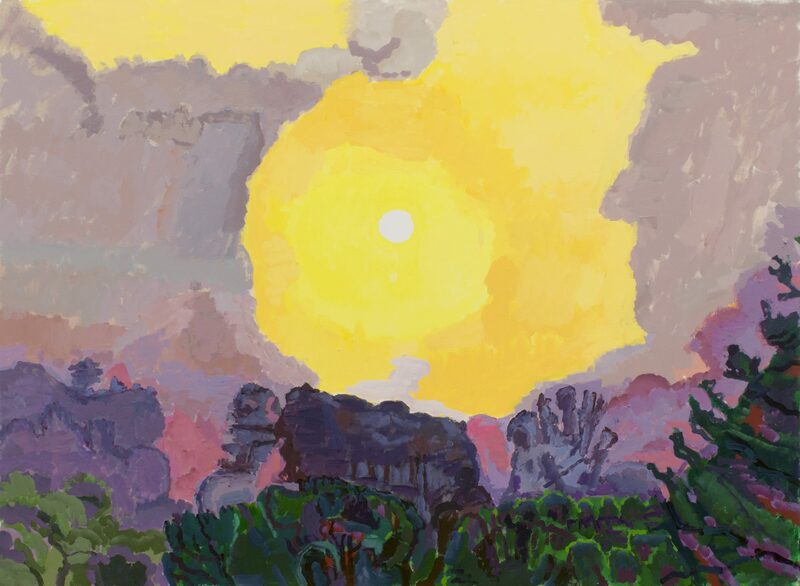 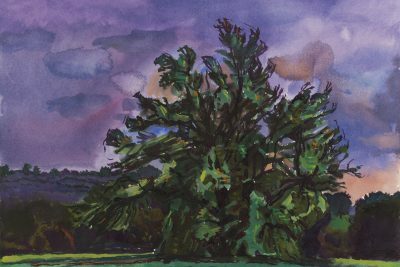 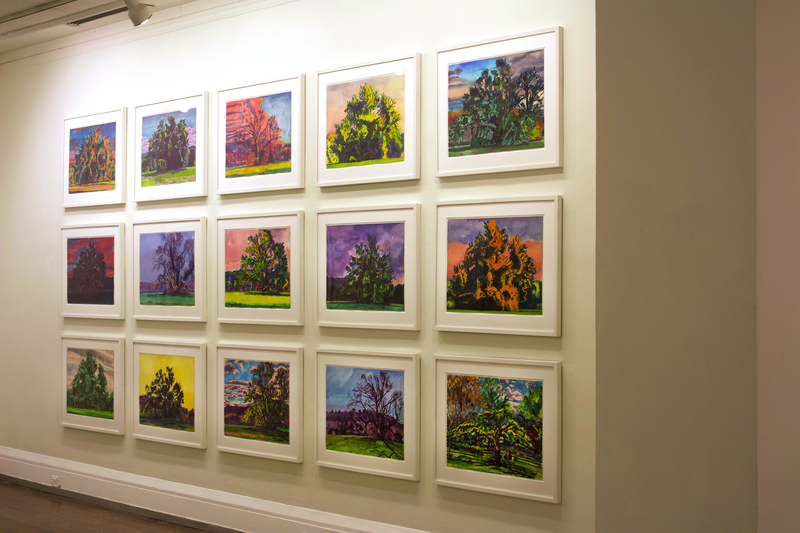 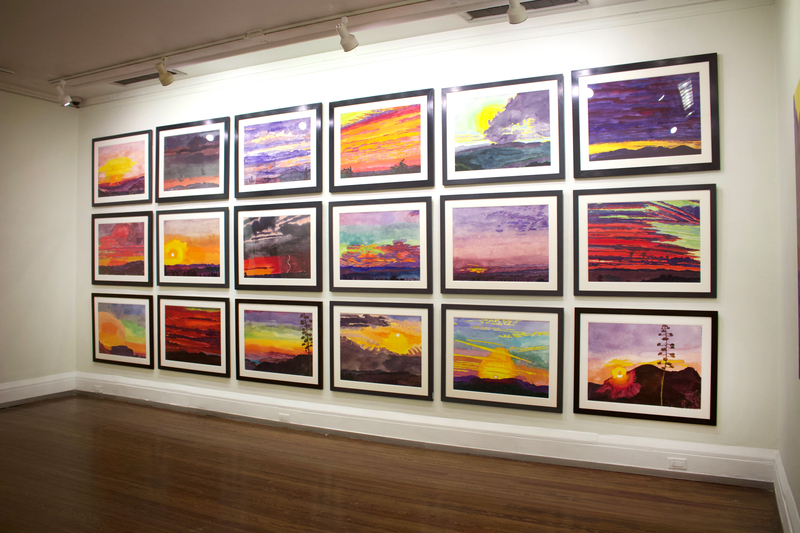 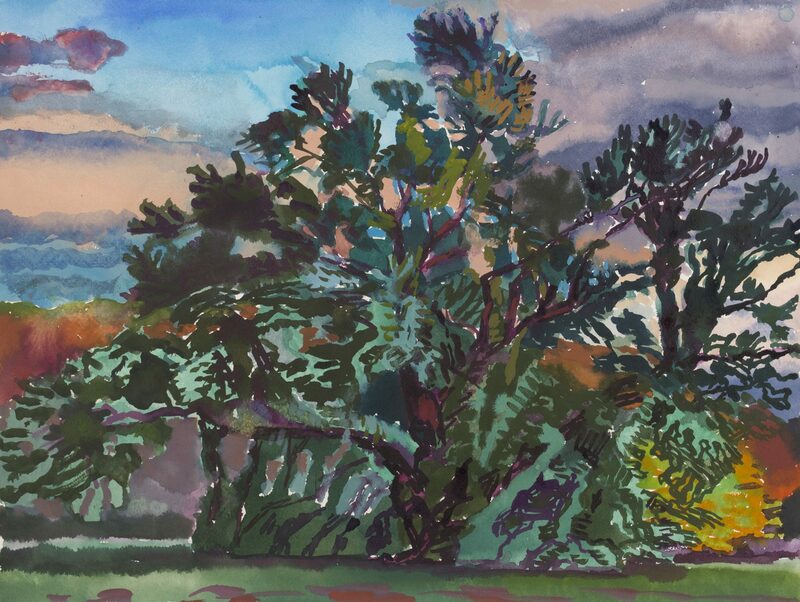 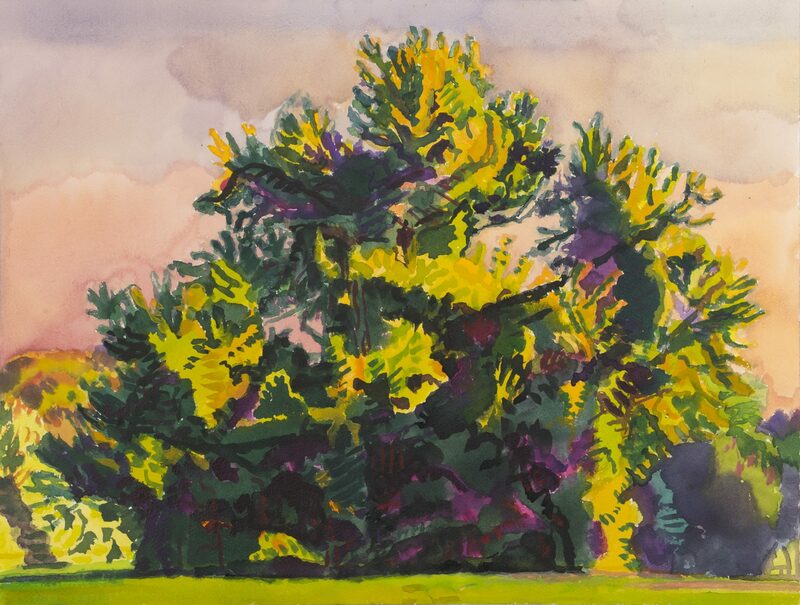 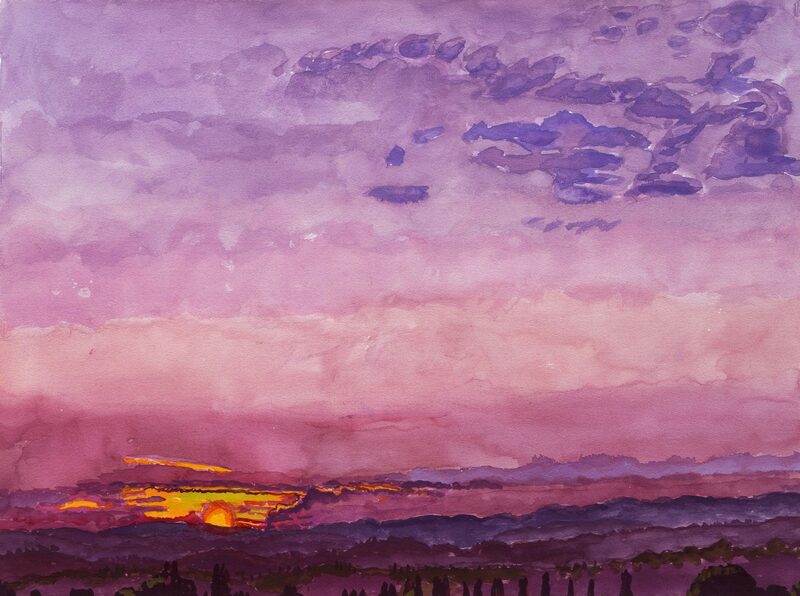 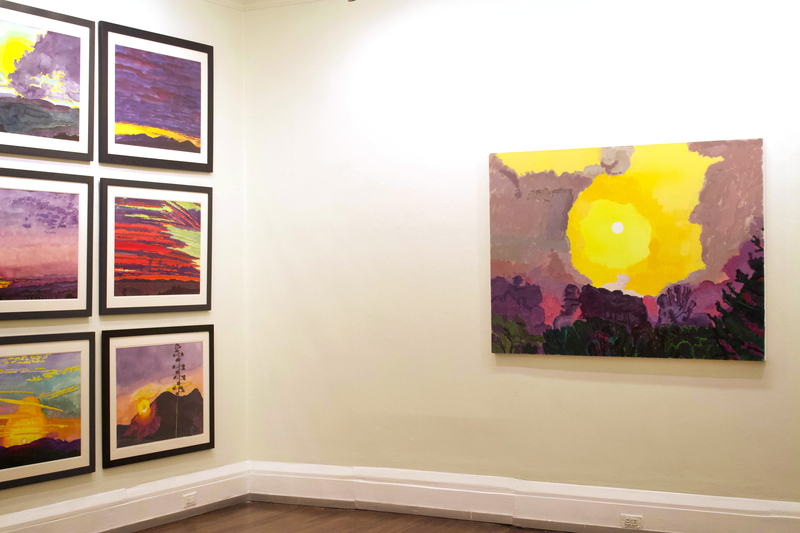 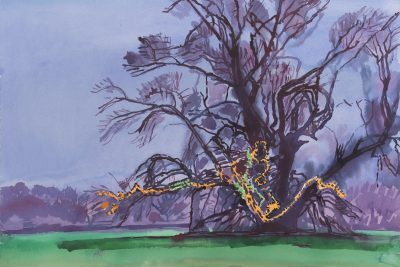 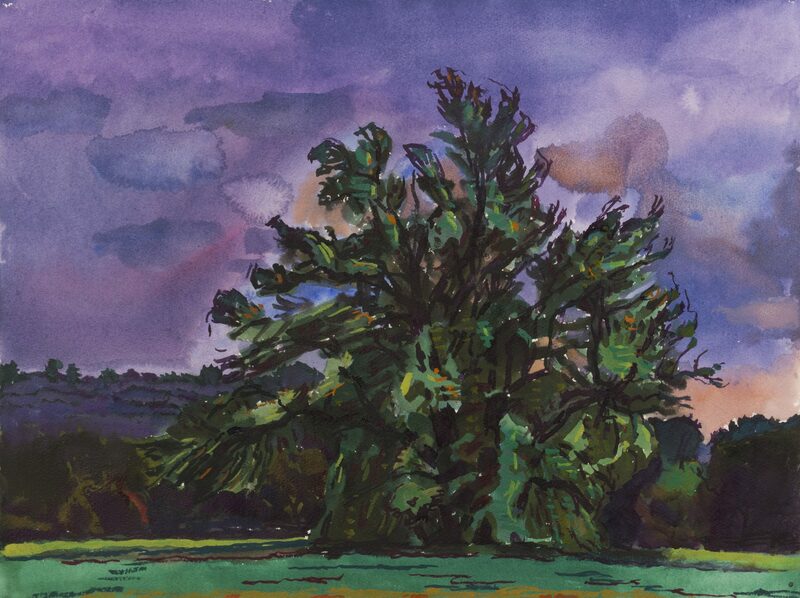 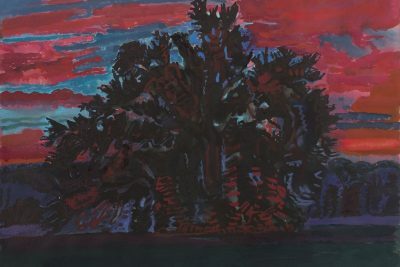 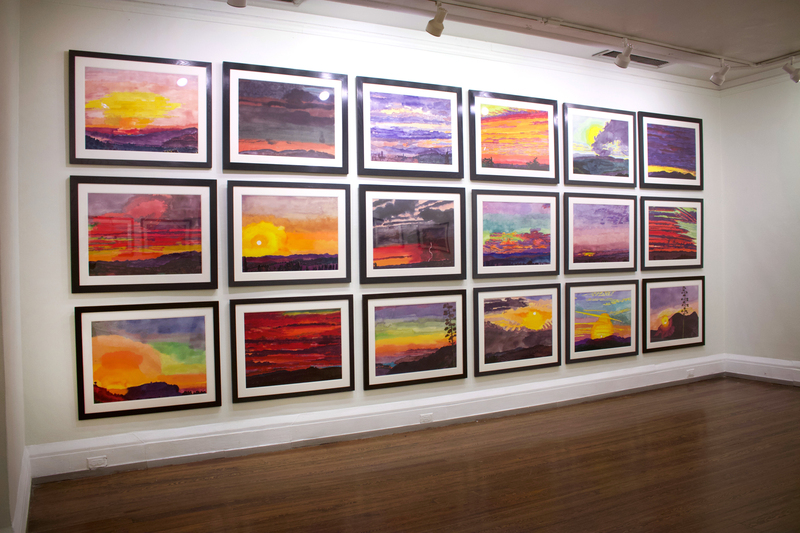 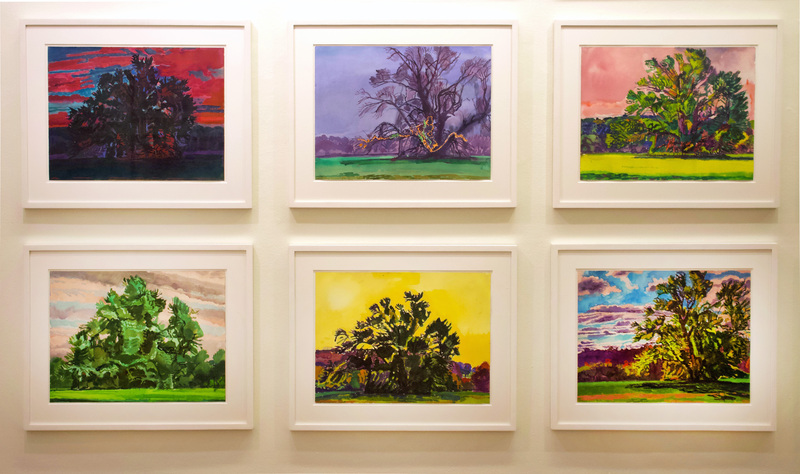 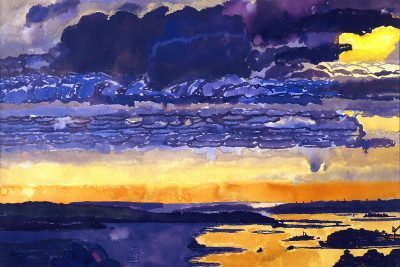 This exhibition presents 45 works by Nickson—unrestrained, rapturous skies and monumental trees, from 1999-2015, all collected by William Louis-Dreyfus. 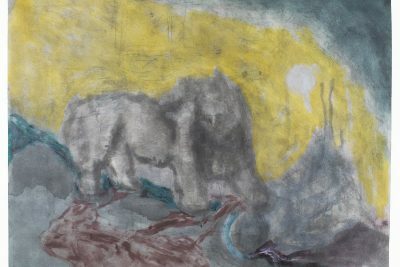 Nickson is never literal. 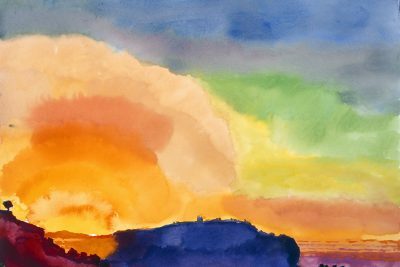 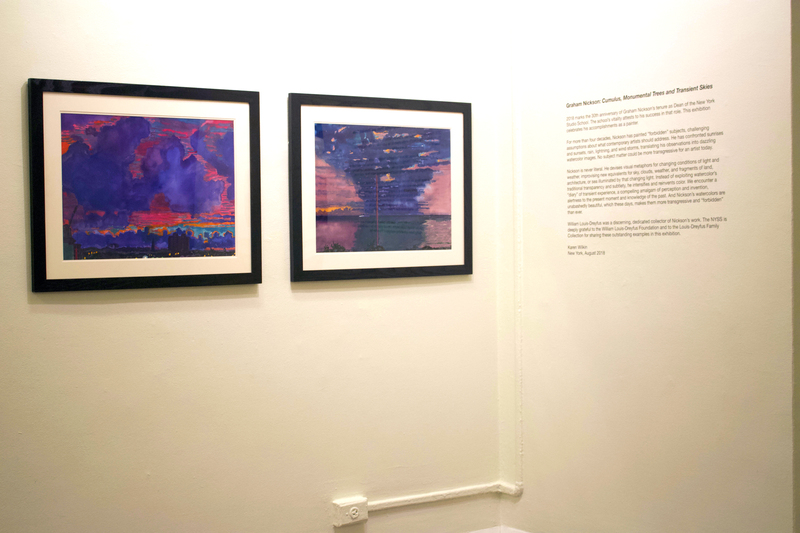 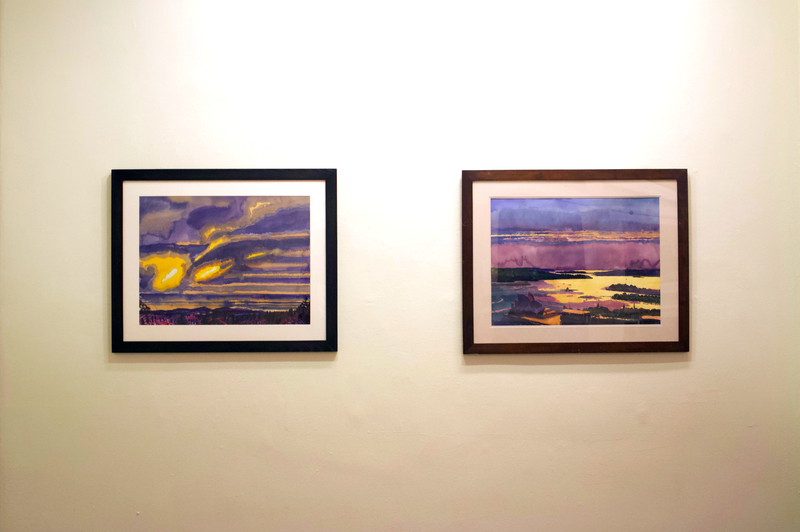 He devises visual metaphors for changing conditions of light and weather, improvising new equivalents for sky, clouds, weather, and fragments of land, architecture, or sea illuminated by that changing light. 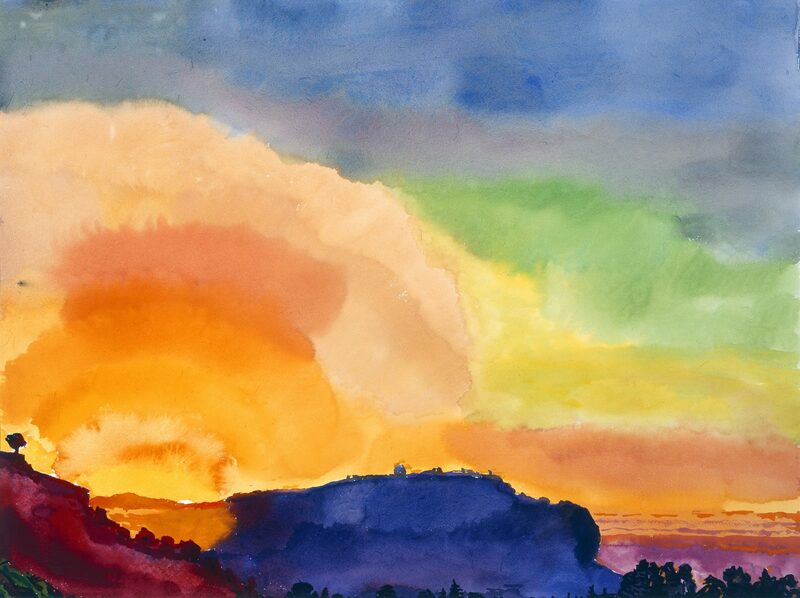 Instead of exploiting watercolor’s traditional transparency and subtlety, he intensifies and reinvents color. 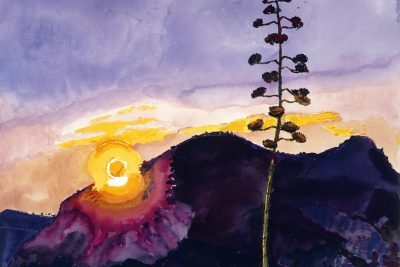 We encounter a “diary” of transient experience, a compelling amalgam of perception and invention, alertness to the present moment and knowledge of the past. 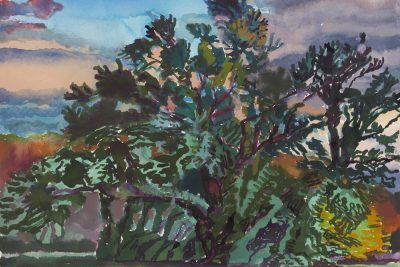 And Nickson’s watercolors are unabashedly beautiful, which these days, makes them more transgressive and “forbidden” than ever. 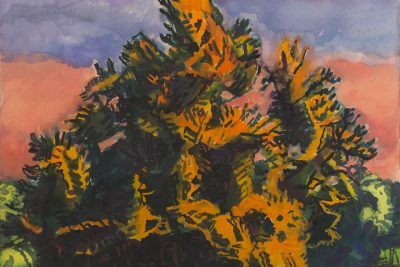 2018 marks the 30th anniversary of Graham Nickson’s tenure as Dean of the New York Studio School. 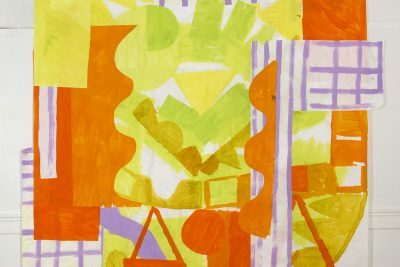 The school’s vitality attests to his success in that role; this exhibition celebrates his accomplishments as a painter. 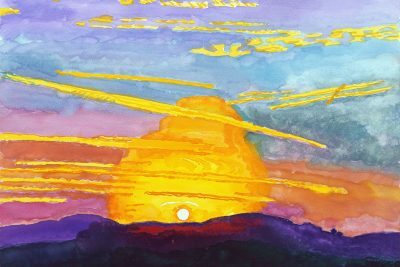 Under Dean Nickson’s leadership, the school has flourished, attracting students from all over the world. 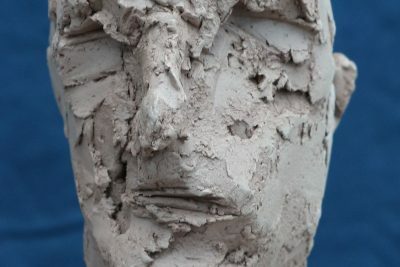 The founding principle that artists learn by making art remains unchanged, enriched by such important additions as Dean Nickson’s invention, the two week painting, drawing, or sculpture marathons that begin each semester, and the Master of Fine Arts program, along with the acclaimed lecture series and exhibition program, both open to the public. 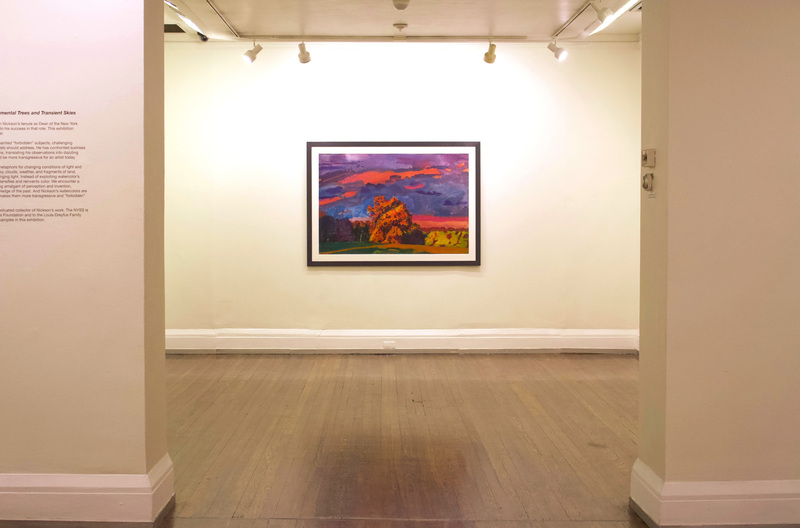 The historic importance of the room where Gertrude Vanderbilt Whitney entertained visitors to her sculpture studio – the building’s original function, before she founded the Whitney Studio Club and later the Whitney Museum of American Art – has been officially recognized and the façade, dating from the establishment of the museum in 1930, has been restored. 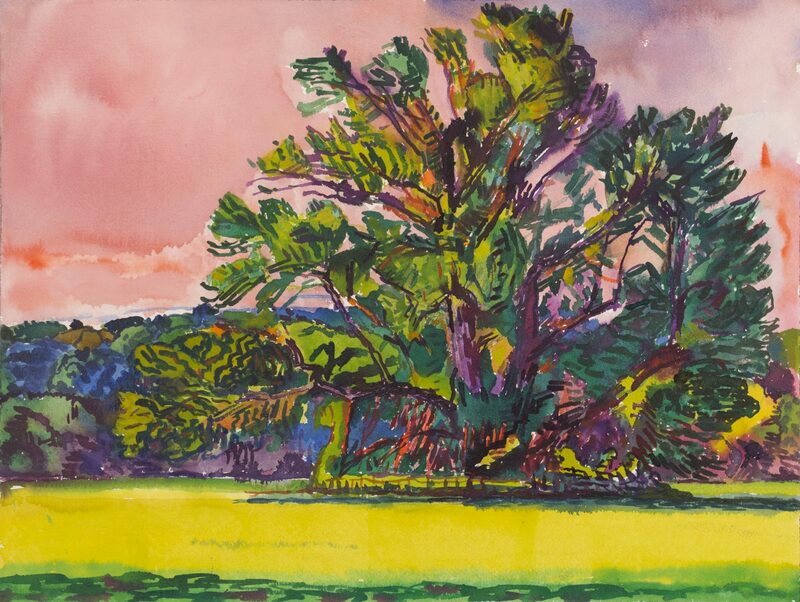 William Louis-Dreyfus was a discerning, dedicated collector of Nickson’s work. 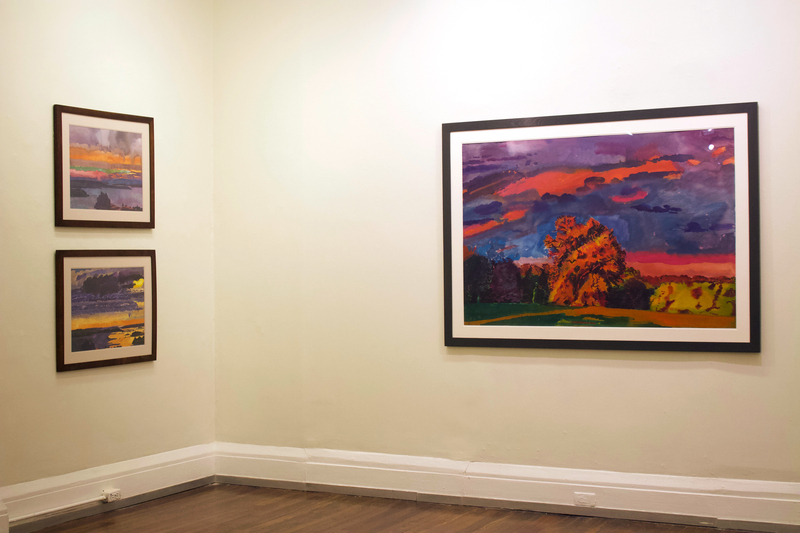 The New York Studio School is deeply grateful to the William Louis-Dreyfus Foundation and to the Louis-Dreyfus Family Collection for sharing the outstanding works in this exhibition.